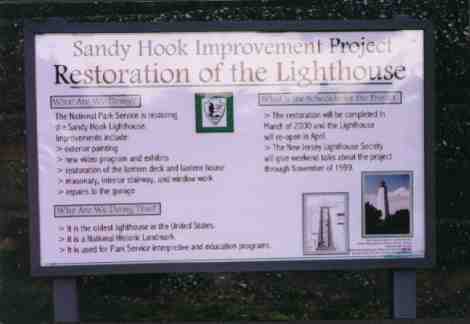 This is the sign outside the lighthouse, detailing the work. This picture was taken on 9/17/99. You can see the support towers on the left and right side. The towers lift the scafolding up and down so the workers can work on the tower. 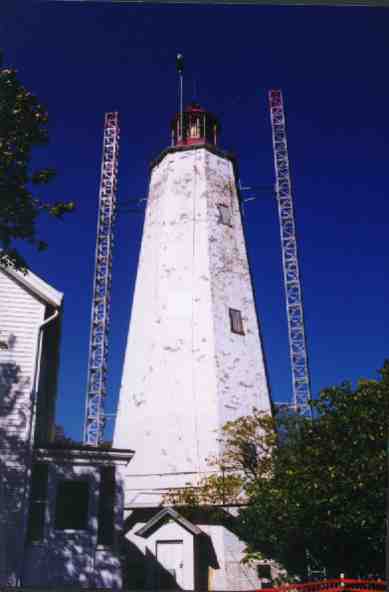 This picture was taken on 10/16/99 and is a close up of the lens house. You can see wooden boards placed around the back of the lens to protect it during the power washing. This picture, also taken on 10/16, shows the tower from just outside the saftey fence. You can see the scafolding, just above the entrance to the tower. This was taken right after the first power washing. 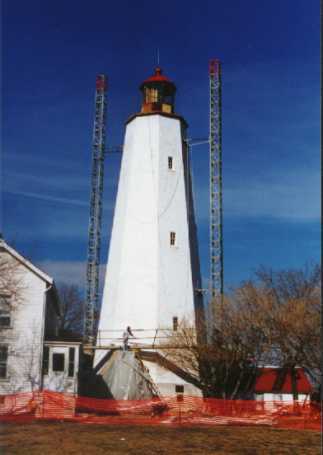 This picture was taken on 2/26/00, and shows a worker, working on the scafolding above the entryway to the tower. 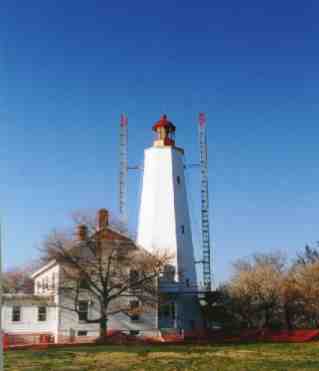 What the picture focuses on, is the freshly painted tower. The infamous stain has been removed. 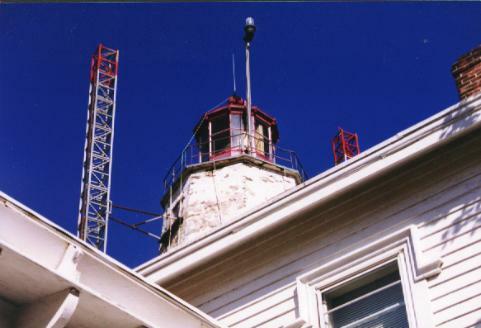 Also note the railing around the lens house has been removed. This picture was taken 03/12/00. 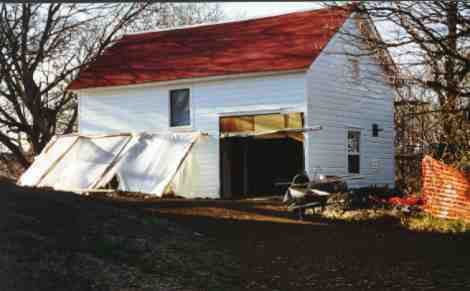 03/12/00, the image focuses on the just finished entryway. A new door, that locks, is now in front; as well as a fresh coat of paint. 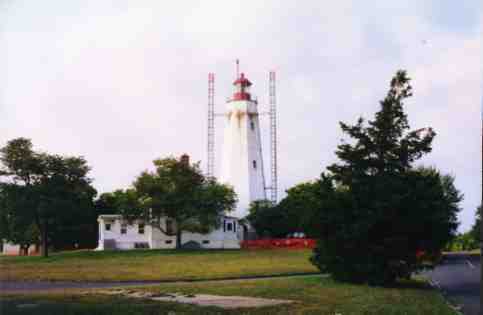 This picture, also taken on 03/12/00, while not of the lighthouse, is of the second structure to be rennovated. 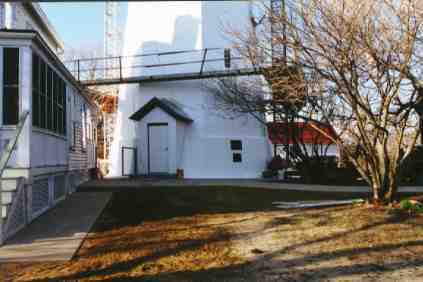 This barn, is alleged to be an old carriage house, behind and to the right of the tower, when looking straight on. The door on the right (uncovered) opens up to a room that will hold the back-up generator for the light, along with the sensor. The door on the left (covered with tarp) is going to open into a room that will house interprative displays for when guides are not on the grounds.